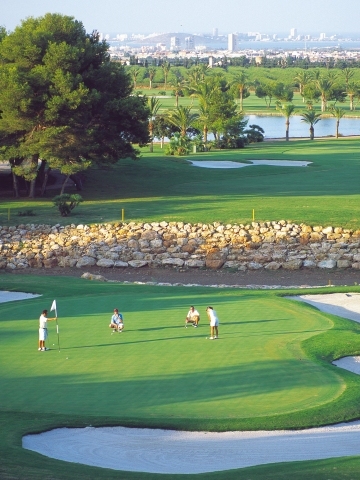 WEDNESDAY INDIVIDUAL STABLEFORD OR MEDAL Last Wednesday of the month - Individual Medal (Qualifying). Names and handicaps of all players. Spanish Golf Federation Number if you are federated with RFEG. Dates of Competitions you wish to enter. By entering in either the Friday competitions or the monthly competition, players will be entered into the Order of Merit which covers the best 8 performances between March 2019 and February 2020. Trophies and vouchers will be awarded to the winners. Click her to find out more about the Order of Merit. CONGU handicaps will be adjusted in accordance with EGA/CONGU rules before slope is applied. All players with a legitimate and current handicap qualify to win vouchers. A qualifying competition will require a minimum of 6 players. In the event of fewer than 6 entries the Competition will be cancelled. 12 or fewer players will play in 1 qualifying mixed division. The draw & tee times will be by handicap order for Medal competitions. All other competitions will not be drawn in handicap order. Players can request to play with one other person per tee time. The entry for the competitions will be closed 48 hours in advance. The starting time draw will be done the day before the competition and will be posted on the Noticeboards. For further details contact Golf Administration. For those who wish to join the Spanish Federation the cost is 75.10€ and can be applied for at Golf Administration and paid for by setting up a direct debit through your Spanish Bank account OR by paying with a credit card. ......or visit Golf Administration in the Pro Shop in the North/South Courses Clubhouse.